DJ Special Effects PERFECT STORM Lightning Thunder Sound Activated Synchronized Flashing Lights Controller Box – Rave Lite FX Cosplay Costume Dance Party Haunted House Halloween Prop Building Supplies Decoration. 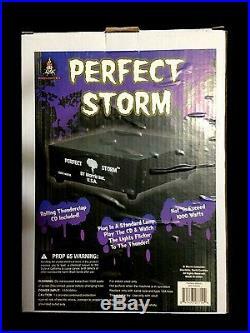 PERFECT STORM Halloween Prop Building Rave Dance Club Party Lightning Special Effects Controller Perfect Storm allows your lights to flash on and off when you hear thunder on the CD supplied. Simply play the CD supplied with the unit, plug in your lights to the Perfect Storm Box and place in front of Cd Player. When thunder is heard, lights will flash in synchronized fashion. Includes a controller that flashes up to 1000 watts of your own lights to the sound of thunder, and CD with over one hour of sound effects. CD player not included. Perfect Storm does allow for changing intensity of lightning flicker (varied by volume), as well as variable sensitivity level of background noise for the lightning reaction. So, the louder, the brighter. Variable sensitivity works very well, for more lightning control with the least interference from other outside noise levels. This is a single channel, but works like the more expensive versions. Compatible with mobile phones, MP3 and CD player. Power input 120v/60 hz. Uses type 15A fuse. AC jack and audio jack. No direct line input. Works with a microphone. Thunder and Lightning CD provided is adequate. You may also use your own cd or mp3 of thunder sounds. Place unit directly in front of speakers for best results. MPN: HH-MR-VA-621 UPC: 841493077144. 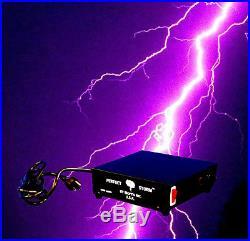 This makes for great thunderstorm effects for your haunted house or home haunt/Halloween party. 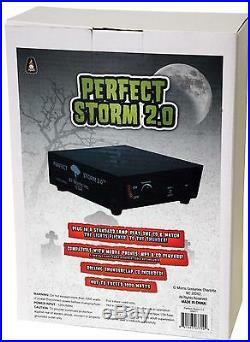 Simply play the CD provided with the unit with your lights plugged into the back of the Perfect Storm Box which can be plugged into any 15 amp. Please note that total lights used should not exceed 1000 watts of power or a reset fuse in the back of the unti will trip. If this happens, reduce lights used and hit reset button on back of unit. Using either of these two ways, when thunder is heard, lights will flash in synchronized fashion. Includes CD with over one hour of sound effects, CD player not included. Power input 120v/60 hz. Uses type 15A fuse. AC jack and audio jack. Round sensor knob on front of unit is adjustable to make lights flash to your liking. The Perfect Storm will work with a variety of different types of lights in including both incandescent and LED. (Not recommended for flourescent lights). For indoor use only. USA AC use only: International buyers would need a DC adapter, NOT included. The item “DJ Special Effects PERFECT STORM Thunder Sounds Lights Controller Halloween Prop” is in sale since Thursday, September 10, 2015. This item is in the category “Collectibles\Holiday & Seasonal\Halloween\Current (1991-Now)\Props”. The seller is “horror-hall” and is located in South Elgin, Illinois. This item can be shipped worldwide. *FREE SHIPPING FOR US MAINLAND: Alaska, Hawaii, Puerto Rico- Please Inquire!! !